"A sweet coming-out story for junior high readers. The clever Shakespeare content is a bonus. Verdict: A fine choice for middle school libraries in need of accessible LGBTQ stories, and a great option for students reading or performing Romeo and Juliet"
"Star-Crossed takes the drama, humor, friendships, misunderstandings and romance of Romeo & Juliet and transforms them perfectly to the middle school stage. One word about this honest, heartfelt middle grade novel for the theater geek in each of us? Encore!" "Star-Crossed by Barbara Dee cleverly draws from Romeo and Juliet, providing readers with an insightful introduction to Shakespeare while exploring the complexities of young love. Readers will root for this relationship." 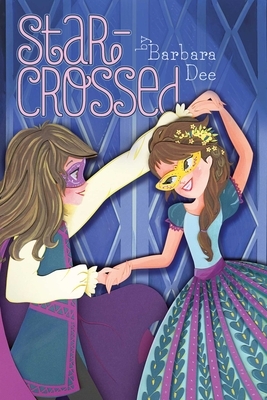 "Barbara Dee's Star-Crossed is a love story, a rallying cry for girl-power, and a Shakespeare lover's dream come true. When I finished reading, I had a huge smile on my face and a lightness in my heart." Mattie is excited when her favorite English teacher, Mr. Torres, announces that their eighth grade play production will be Romeo and Juliet. As the class studies the play together, Mattie really connects with the characters and their speeches. When the male lead drops out of the play, Mattie steps up to play the part of Romeo. Things become complicated as Mattie develops a crush on her Juliet co-star, Gemma Braithwaite. Gemma is pretty, smart, and talented, and Mattie just can’t figure out what to do about a crush on a girl. It’s a good thing that Mattie has her best friends, a caring sister, and supportive parents to help her work through her complicated feelings. The events of the story playfully mirror the events of Romeo and Juliet. As Mr. Torres teaches his students to understand the Shakespearean text, Mattie finds she can apply what she learns to her own life’s difficulties. This is a sweet look at unexpected first love.